Here’s another skater spotlight to reflect on our time at Porter! Today’s skater is Kathleen Albert. Kathleen is from the Los Angeles Area and is currently a junior at Notre Dame. She is majoring in Romance Languages and Literatures (specifically French and Italian), with minors in Portuguese and Business Economics. She will be studying abroad at the University of Bologna in Bologna, Italy next semester, so this was her only competition with us this season! “This year has been so much fun so far. Our team has grown so much and has so much potential! 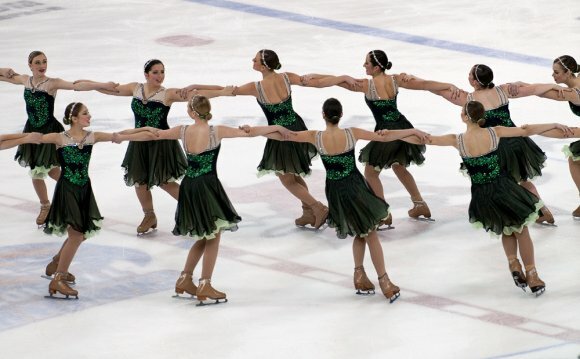 I still feel so new to the synchro world so I can’t give you in depth details about the differences between this year’s porter competition and last year’s, however, I will say that I felt like we killed it! I think what’s really improved is our energy and “teamwork”. We can all feel it when we skate and it’s definitely noticeable when we watch ourselves via video. I think this year’s program is much harder technically but I feel like it fits our style more. I love our new tricks like the back flips, duck under spirals and death spirals but also enjoy how much more speed we have this year. I think by the end of the season the program will look incredible! Some fun facts about Kathleen: She loves dogs, pictures of dogs and lemons. Here is another one of our amazing skaters, Jackie Marzsaleck. Originally from Burr Ridge, Illinois, Jackie is pursuing a nursing major and biology minor at Saint Mary’s! “I’m so excited for this upcoming season. I'm ready to show our improvement from last season and compete against some of the new teams such as North Dakota! I've really enjoyed meeting all the new skaters that have joined the team. Less than half of the team have a synchronized skating background so it's cool to see so many solo skaters showing interest in skating with us. The most memorable thing about NDFS was my first skating competition with the team. We were in the locker room and realized we left our skating dresses on the bus. We couldn't find our bus driver to unlock the door so we almost had to skate in our NDFSC skating pants and tank tops. Luckily, our bus driver found us 5 minutes before we went on the ice. It was a close call.